With invitation by IMADR Latin America Base and its partners, Bishop Gunnar Johan Stålset, a member of the Norwegian Nobel Committee, visited Argentina from 7th to 10th September. 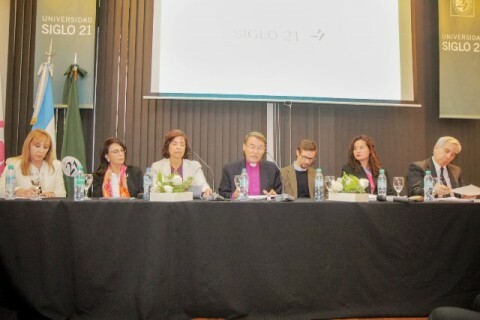 At the panel on “Universal Culture of Peace and Human Security – Peace as a Human Right” held in the Siglo XXI National University, Bishop Stålsett delivered his insightful presentation on the right to peace. Universal Culture of Peace and Human Security – Peace as a Human Right. Is it a human right to live in peace? Surprisingly, today it is not. But it should be. On the backdrop on a rather cold climate for human rights in our world today, I hope our discussion today may contribute to a rethinking of the resistance to claiming peace as a human right. We need a broad conversation to build a consensus that to live a life in peace and safety definitely is a human right that should be enjoyed by every human being. And we must consider the political and legal instruments that necessary to establish this right in international law. An important step is to break the silence. When I tried to google Peace as Human Right what I got was: Human rights to peace and quiet! In many ways the cry for peace as a human right is a cry in the wilderness of politics and diplomacy, of cynicism and complacency. There is an ominous silence around one of the most urgent issues of all ages, that of human right to life and peace. It is about peace as a God-given right, a natural right, and peace as a human right. The issue is how peace best should be respected by governments and protected by international law. Yes indeed the right of people to a life in peace and quiet! Peace is a spiritual leitmotif, found in all religions, in all cultures and professed in all politics. The promotion of peace should thus be the highest aspiration and most noble cause of humanity. In the words of Jesus in the Sermon on the Mount: Blessed are the peacemakers. In my view the longing for peace is the greatest common feature of all humans of all ages; peace not only of the soul, but peace as a life in harmony with “the other” and with nature. Peace is the dream of every new generation of children in a world of want and strife. This is what urges us to consider the case for peace a fundamental human right. The international community has engaged over decades in discussion on whether the family of nations, should declare peace to be one of the human rights equal to human rights to life, or whether we should be content to see peace as one dimension of right to life, and right to life as the sum total of all human rights. My hope is that seeing human right to peace in light of a universal culture of peace and human security, the moral imperative for peace as a fundamental human right both on an individual and a collective level will be strengthened. I am aware of the difficulties this issue raises within the framework of juris prudence of international law, but I suggest that a moral and philosophical approach is helpful in moving us further. In the final analysis, to declare peace a human right is a political decision that demands consensus on the world stage of the United Nations. The issue of human rights is about a culture of peace and not a culture of war. It concerns communal security and common personal safety, peace effectively as a right and a duty for the individual and the community of nations and states. If we speak of a universal culture of peace, we affirm the importance of our social context, not only the historic roots, the web of tradition that defines us, but the values that today permeates our nation and each one of us as an individual, in confluence within the global community of nations. Our topic has permeated the discussion within the UN since the Charter and the Universal Declaration of Human Rights were signed by world leaders as a reaction to the horror of war in the 20-ieth century. The UN GA resolution 39/11 of 1984 “Declaration on the Right of Peoples to Peace” raises the issue of collective and individual rights. We should be concerned with people’s right to peace and with the individual person’s human right to peace. A human right to peace would strengthen people’s rights, not diminish them. One added value of the human perspective is that of the victims. The quest for a declaration of Human right to peace is driven by the personal suffering of women and men, children and the old. This is the motive in post conflict processes on truth, justice and reconciliation. While right to life is established as international law, this is not the case for right to peace. If right to peace is seen as a specific human right, sui generis, this would impact international law and institutions. Today the vexing question is if laudable efforts to strengthen the primacy of peace in the framework of the universal human rights regime will end in quiet at the UN General Assembly next month when the report of the HRC is on the agenda. Or will it give peace a better chance in the 21st century? Why should human right to peace be a matter of great urgency today? How can we meaningfully speak about peace at a time when we are daily confronted with the dramatic reports and images of war and terror, of hunger and migration? Or rather, how can we not speak about peace as a fundamental right of every human being when they are traumatized and killed because they are human? The proliferation of nationalistic, ethnic and religious extremism in every region and every religion today is a dramatic backdrop for a discussion on peace as a human right. It is indeed tragic that terrorism, poverty, hunger and exploitation are dominant features at the beginning of the 21century. The combined effect of terrorism, poverty and man- made climate change has brought 60 million persons worldwide to flee their homes and seek a future for their families across the dangers of desert sands and treacherous waters. The celebrated deal with Iran notwithstanding, the nuclear clock, established and overseen day by day, by nuclear scientists, is again nearing midnight. Silence about this threat to world peace is dangerous. With the graphic exposure to the horrors of Hiroshima and Nagasaki 70 years after the event, a fundamental moral issue is reopened; are we willing to risk an apocalyptic suffering, even the extinction of the human species, the destruction of every living creature and the future of our natural environment and habitat? The survivors of the nuclear holocaust could be said to have been granted right to life, but what about their right to peace? And what about the human dignity of the hundreds of thousands whose right to life and to peace that so brutally was violated? Human rights on the decline. Paradoxically today some elements of the struggle against extremism is undermining human rights and strengthening the hand of terror. Such civilizational values as freedom of religion, freedom of expression, freedom of movement, are being rolled back in the fight against extremism, indirectly giving victory to the terrorists for whom human rights has no meaning. A parallel undermining of the primacy of human rights in the fight for peace and justice is seen in an alliance between religious conservative establishments and political reactionary forces when they claim that their sectarian or provincial traditional values stand above human rights. Likewise the Universal Declaration of Human Rights is undercut by the insistence on the supremacy of regional values, be they European, Asian, or African or whatever. A driving force in the quest for peace on the individual, national and global level has been the need for security. Human security has thus emerged as a shared political and moral imperative in international politics and international law. It has given impetus to creating new instruments to protect freedom and to promote justice in the interest of peace. National security is sometimes played out against individual security. If national security reflects people’s right to peace, individual security would be protected by human right to peace. Human security is how peace is enjoyed by every citizen. Safety is the human face of human security. The term safety is softer than the military and police power associated with the term security. There is no human security without respect of the physical conditions necessary for our personal well-being. Ultimately human security is about the survival of the human race, not only survival of the fittest, the richest, the privileged minority, but also about a decent future for the hungry, the poor, the oppressed and excluded. There is a growing recognition of the limits of military means in creating a safer and more secure future. None of the ongoing acts of war and aggression can be solved militarily. The political and moral way of diplomacy and dialogue is the humane way to peace and freedom. If humanity is to prevail through this millennium peace is the imperative, not war. A declaration of peace as a human right would strengthen the struggle for human safety and add to its moral weight. As a theologian I have learned that to every sacred text there is a body of interpretation reflecting new insights, contextual adaptation and aggiornamento. Often an interpretation transcends the literal meaning of the original while reflecting the same spirit in a new day. Not to re-interpret may be a betrayal of the legacy of the founding statesmen and their helpers who crafted the solemn duty to maintain international peace and security. It is through the continuous interpretation of fundamental texts that their validity is confirmed and their relevance rediscovered. It is this process of interpretation that rescues them from receding into oblivion. This is also how international law develops in a dynamic process of interpretation and application by the «priesthood” of statesmen and diplomats, by academicians in many fields and by activists for many causes. This is what brings justice forward in ever new dimensions. Human dignity – human right. The UN Charter stands tall in human history both as an echo of sacred texts and of secular human traditions, and is in itself a core text of foundational quality. It distills the essence of divine and human affirmation of the sacredness of the person by making human dignity the foundation for all affirmations of peace and human rights. It establishes the primacy of human dignity. The dignity of every women, man and child is our birthright to peace. We the peoples of the United Nations determined to save succeeding generations from the scourge of war… and to reaffirm faith in fundamental rights, in the dignity and worth of the human person …to ensure, by the acceptance of principles and institutions of methods, that armed force shall not be used, save in common interest…The UN charter puts the peoples at the center; we the peoples. It spells out that to promote peace, justice and reconciliation is our joint sacred and secular duty. It makes peace the supreme goal. The reference to the people, to us, is a reminder that democracy in international politics is not only about the voices of statesmen and governments, but about civil society and concerned citizens, including religious movements. The UN Charter links the fight against the scourge of war to faith in fundamental human rights on the basis of the dignity and worth of the human person. The logic is that armed forces shall not be used. Regrettably there is no full stop after these important words. Rather it adds the following words:” save in common interest”. This reservation which must be understood as post war reminiscence undermines the fundamental principle of human dignity as inviolable and sacred. If there indeed is a common human interest it is found in the interest in peace, not in war. It is such common interest has yielded fruit in instruments for peace such as the conventions prohibiting the use of biological and chemical weapons. These points to a day when there would be a convention against not only the use of nuclear weapons but the possession of such weapons. In whose common interest, we may ask, was the nuclear annihilation of Hiroshima and Nagasaki 70 years ago? Those who survived, enjoyed in a manner of speaking life, but they could claim no right by international law to peace. The radical question before us is therefore if any war in the modern age can serve a common good? Is not war itself an expression of lack of common interest? If right to life is to be respected, the issue of the right to war has to be reconsidered. If right to peace is declared a human right in itself, the right to war is made ever narrower. Today we need to challenge this notion that war should ever be of common interest. In other word the dynamic process of reinterpretation must move us beyond the right to war to the right to peace. At a time when the culture of war is prevailing, it is a moral, spiritual and political duty to build a universal culture of peace. This is a battle of mind and heart of politics and prayers. The preeminent global instrument for the promotion of a culture of peace is UNESCO. The preamble of its Constitutions in itself a beacon of humanism: “since war begins in the minds of men, it is in the minds of men that the defense must be constructed”. The UN Declaration on a Culture of Peace defines a culture of peace as a set of values, attitudes, traditions and modes of behavior and ways of life. Culture is seen as a living process, historical, dynamic and constantly evolving. It is only by recognizing our own cultural endowment, appreciating our own historic roots and respecting our social context that we can meaningfully contribute to universal culture of peace. In this context, I take universal to mean relevant for all, global in outreach, encompassing all humanity, expressing fundamental values shared by all religions and world views. Its expression in the Christian vocabulary is ecumenical and catholic, both giving the connotation of the whole world. Its message is: one world, one humanity one civilization and one peace. The rich resources revealed within every culture need to be joined in the greater vision of many cultures as one unifying culture of peace. Since 2008 the HRC has been seized by the issue and made efforts to promote the right of peoples to peace. In 2010 the HRC requested the Advisory Committee to prepare a draft declaration on the topic. The working group has consisted of UN member states, civil society representatives and academicians, and worked in a very open manner committed to the principle of consensus. The chairperson/rapporteur of the Working Group Christian Guillermet-Fernadez, Deputy Permanent Representative of Costa Rica to the United Nations, Geneva, has together with his staff, worked tirelessly to move the issue forward on a rather bumpy road. Already from the beginning however it became evident that there was little support for crafting new language for a declaration of peace as a human right. The red line was drawn at the word human. Although the Chair praised the respectful atmosphere and spirit of dialogue and cooperation, he concluded that consensus had not been reached. He recommended that the Human Rights Council considers whether the international community is ready to develop further the right to peace in a consensual manner. It is my impressions that the process of developing a consensus on a Declaration of human rights to peace at the Human Rights Council in Geneva has been blanketed in too much quiet; it has not captured the attention of world leaders or the engagement of mass movements’ within civil society. Diplomats have in a fundamentalist’s way argued for old texts based on ideological prejudices and fear of giving away the option of war should national or alliance interest so dictate. Some rather ludicrous arguments have been used to stall the process, such as the argument that human right to peace is not reflected in international law- as if international law is immutable. From my engagement with religions and peace, I find that the failure to engage religious leaders on a topic so close to their professed moral values and spiritual base is unfortunate. The involvement of representative organization like Religion for Peace, often in close cooperation with the UN and its agencies, on issues like landmines, cluster munition, nuclear disarmament, the climate and HIV/Aids, has been important. When the cluster munition agreement was signed in Oslo the spokesperson of the UN stated that without the mobilization of religious leaders worldwide, this would not have been achieved, at least not in the short space of time. I would humbly maintain that as long as war is regarded as an accepted means of creating and solving conflicts, the moral compass of humanity has to be adjusted. For even without a UN declaration, peace is a priori a human right. War is not our birthright, peace is. The right of people to peace is a right for states. The human right to peace is about the right of individuals. These are two sides of the same coin, as is right to life and right to peace. The discussion at the HRC should not end in quiet, or go under in the great void of UN documents, but be seen as one more step in the right direction, that of a Declaration on Human Right to Peace. In the present cold climate for human rights one might easily argue that this is not the time to sharpen the edge of the sword of justice and humanity by adding new language to the vocabulary of rights and duties. One could easily argue that the focus should rather be on saving what can still be saved of a universal human rights regime, rather consolidation than advancing. I suggest that to recede is not an option, nor is the status quo. Rather we should redouble our efforts to reinvigorate a universal culture of peace for the security and safety of every citizens of the world. We should mobilize all of us, all the people on every level in society, all people of good will, to move forward with perseverance and in the spirit of hope – and claim the fundamental human right to peace. If, as we must insist, every person on our planet has a sacred right to peace, the day will surely come when this will find its expression in a solemn text establishing every human beings political and juridical right to peace. This I believe is what human dignity demands.